Do You Know Who I Am ? I’m Tracy McGrady Y’All Hearin’ Me ………? I’m Da Man ! I’m Tracy McGrady *%tch ! It’s uncanny how fast things can spiral out of control when you haven’t a pot to pi_s in and a window to throw it out of. Such is the situation that Houston Rockets’ guard , Tracy McGrady now finds himself in. Unwanted , unloved and no doubt in his mind disrespected ? But one shouldn’t be at all surprised by this strange turn of events. The player has now become not just a liability with him having missed the majority of last season in the NBA. But since trade from the Orlando Magic to the Rockets, his productivity and worth has gone down immeasurably. And if you think it prudent that the Rockets ought to fulfill their financial obligation to the player in terms of the $23.25 million that he’s owed for the 2009-10 season. Then I’ve got a riverbed that is filled with gold that I think you’ll find will be of interest you. It’s actually situated in no man’s land somewhere. This season McGrady has seen limited action within the NBA , having returned from micro-fracture knee surgery.The Rockets’ organization ‘did not feel’ that the player was fully fit and ready for the arduous rigors of an NBA season. McGrady, himself would disagree and voiced his concerns vociferously not just in the print and tv media but also to anyone willing to listen to his complaints. Rockets’ coach, Rick Adelman always a calming influence, has seen fit in conjunction with team GM, Daryl Morey to let the player know that he’s now on an indefinite leave of absence and that in all probability they will seek to trade him. Whether or not there’ll be any takers for McGrady and his gargantuan salary remains to be seen. Furthermore, he’s no longer the once dominant force that he still seems to think that he is. Countless months away from the game due to prolonged recuperation for problematical and recurring health issues pertaining to his knees, back and hamstring, has left McGrady looking like the walking wounded instead of a once desired premiere athlete within the league. Any takers for the player and the large financial obligation that would have to be undertaken by that team would be doing so at their own risk. Health issues asides, the player does come along with a great deal of baggage in tow. It’s not that his abilities as a player has come into question but it has been his mental toughness and his willingness to defer to others when asked. He was always ‘the man’ in Orlando but unfortunately for McGrady and the organization , he felt his presence was needed on a far bigger stage than the one proffered to him in O-town. What Disney’s and Mickey isn’t good enough for Tracy McGrady ? Well , I never ! McGrady fought tooth and nail to rid himself of any vestiges of the Eastern Conference franchise. And the organization duly reciprocated by shipping him off as fast as the breeze could take him out of town. Houston may not have been his desired destination but he may have well felt that it would give him a fresh start and the fact that he’d playing alongside Yao Ming didn’t seem to hurt either. On the face of it, the duo should’ve posed a formidable offensive threat on a nightly basis to the opposition in the NBA. But only if that were so and would he (McGrady) be willing to defer to the ‘big man ‘ when asked in terms of the offensive productivity and to enable overall team morale ? Tracy McGrady has been cleared to take an indefinite leave from the Houston Rockets after the former All-Star’s representatives and Rockets management agreed to work together in search of a trade for the disgruntled guard. Sources close to the process told ESPN.com that multiple phone discussions Monday between Rockets general manager Daryl Morey and coach Rick Adelman, in conjunction with McGrady’s lead agent, Arn Tellem, led to a mutual agreement that both sides would try to hatch a workable trade before the league’s annual trading deadline on Feb. 18. “After multiple conversations with Tracy and his representatives, we have agreed to look into trade opportunities and have granted him an indefinite leave from team activities,” Morey said in a statement released Tuesday afternoon. 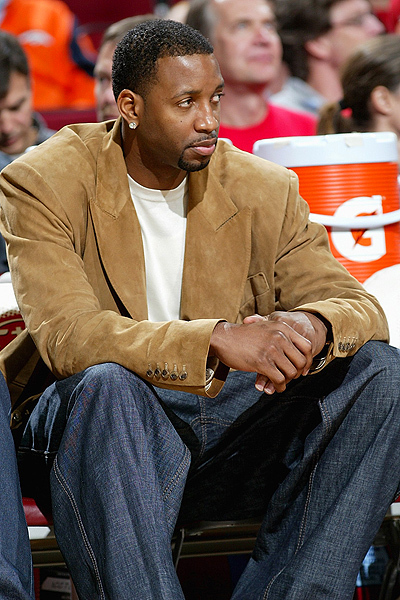 McGrady was allowed to return to Houston during the weekend as the team completed a road trip, when his request for increased minutes in his comeback from microfracture knee surgery was denied by Adelman. Adelman said before Tuesday’s game against New Orleans that McGrady never progressed to the point where he was ready to increase his minutes. In the playoffs last season the fans of the Rockets saw a glimpse of the McGrady of old, as he and Aaron Brooks seemingly played above themselves in the second round of the playoffs. So exhilarating was the combined play of the duo , that they came close to achieving the impossible of almost usurping the high and mighty Los Angeles Lakers led by their iconic player , Kobe Bryant. The Rockets would push the Lakers to seven games , losing in the finale (89-70) and with it the series, 4-3. What made this all the more astonishing was the team did this without the help of Yao Ming. The Chinese center , a tower influence and the engine that drove the team was lost to them prior to the run up of the end of the regular season. The coaches and the team had hoped that the injury incurred by Yao would be nothing more than a mild one. But it would turn out to be something far more overwhelming than that and a complete shock to the organization. The player would suffer what is now to be believed a severe form of plantar fasciitis . And though not at first thought to be a career ending injury, it will need surgery and a long recuperation period. The player will be lost to the Rockets for the entire 2009-10 season. If things as such couldn’t have got any worse , they would then lose Ron Artest to free agency in the off-season. Artest would join the Los Angeles Lakers but in a strange turn of events the Houston Rockets would acquire from the Lakers , Trevor Ariza ,via a similar route. Quid pro-quo ? And as I’d cited earlier , McGrady had outlived his welcome in Orlando. And it appears ‘to be the norm’ for the player whenever real adversity sets in , or when he feels that he’s no longer the center of attention within an organization. He’d done the same damn thing in his first professional stop in the NBA with the Toronto Raptors. There McGrady played alongside his cousin, Vince Carter , and at the time Carter was the ‘human highlight reel’ not just for Raptors’ organization but also for the entire NBA. His prodigious dunks during an NBA game became a staple of ESPN , TNT Sports, ABC Sports, the print media and of course the internet. Jealousy may well have set in on the path of McGrady as he had to play ‘second fiddle’ to his cousin on the basketball court. Of which Tracy McGrady no doubt felt that he was better than Vince Carter at the time ? Both have had formidable careers but neither has yet to win the one thing that they both desire and that is an NBA championship ring. With it comes the acclaim and the fact that their legacy would be set. And in a turn of some irony , Carter now finds himself playing for the Orlando Magic playing alongside Dwight Howard. And as of now it’d appear that Carter and the Magic are legitimate contenders not just for supremacy in the Eastern Conference but also as a legitimate challenger to the Lakers’ perceived dominance of the NBA. For the Houston Rocket and their aspirations for this season. 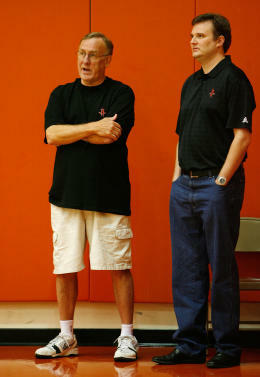 One can only surmise that having lostr Yao Ming for the entire season and the impending trade of McGrady. It would be fair to say that were they somehow able to garner a playoff berth , it would be seen as a tremendous achievement by the organization but in particular by Adelman’s coaching staff. This Houston Rockets’ team is very good but nowhere as good as it would be , were both Yao and McGrady fully fit and at the height of their basketball dexterity.